Home > Entranceexam > SRCC Cut Offs 2018 - 6th Cut Off List Is Available Now! SRCC Cut Offs 2018 - The sixth cut off of SRCC has been uploaded on 17 July 2018 Admissions to SRCC will be done on the basis of Class 12 marks through the centralised admission process of Delhi University. 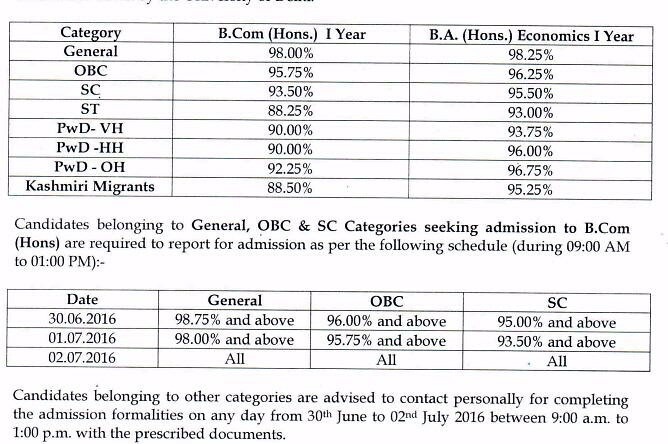 SRCC cutoff 2018 has been released to seek admission in B.Com (H)/ BA (H) Economics courses. The average of the highest marks in any four subjects i.e. "Best of four" in Class 12 examination is the basis of cut-offs. The candidates who meet the minimum marks required as per the SRCC 2018 Cut off can approach the college campus for verification of the documents and the admission process. However, those who do not meet the cut off are suggested to wait for the further cut-offs. SRCC also gives hostel facilities to the enrolled students. Hostel Seats for both boys and girls seats available in Shri Ram College of Commerce. Latest Update - SRCC Sixth Cut off list for the year 2018 has been released on 17 July 2018. The same is available on this page. The Delhi University invites the application for the colleges affiliated with the University. The annual fee for SRCC College is now available as per the category of the candidate. The candidates can get the complete list of annual course fee payable for different programmes. The annual fee for each programme offered in the SRCC is given below in INR. The candidates can go through the table below. 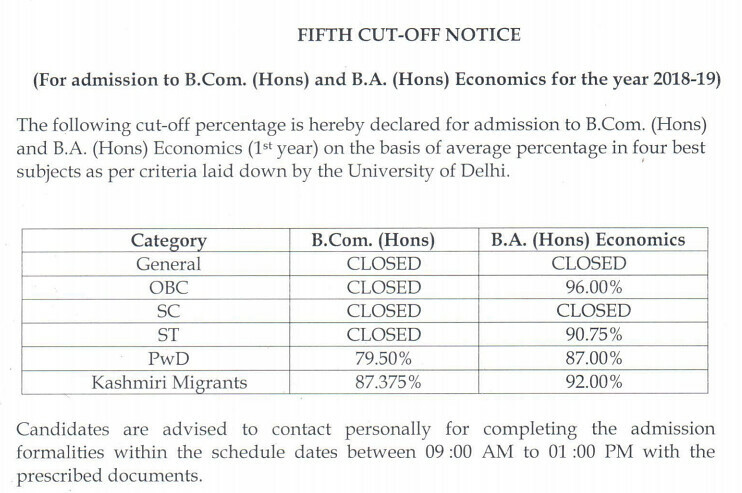 SRCC first, second, third, fourth and fifth cut off marks was released by Delhi University. Now the college has released the sixth cut off list on 17 July 2018. The candidates who have filled the registration form for admission to Shri Ram College of Commerce can check the cut off marks here on this page. 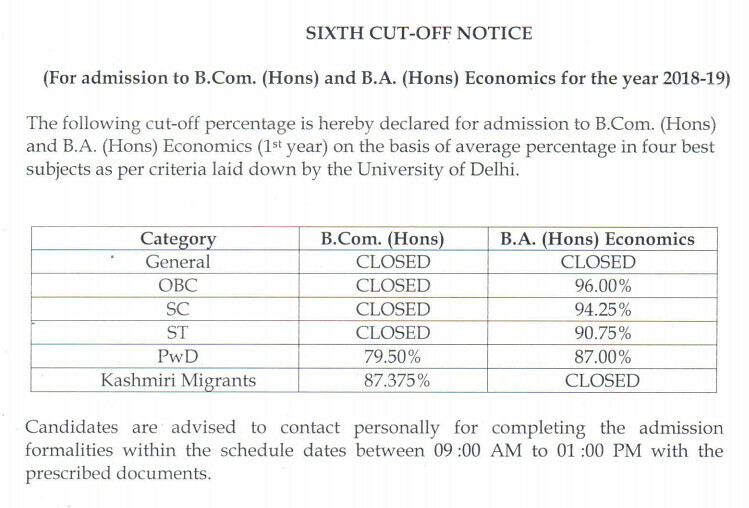 Cut off marks of SRCC is released for admission to B.Com (Hons) and BA (Hons) courses. The candidates who meet the SRCC 2018 Cut off can approach the college campus for verification of the documents and the admission process. However, those who do not meet the cut off are suggested to wait for the further cut-offs. There would be total five cutoffs. 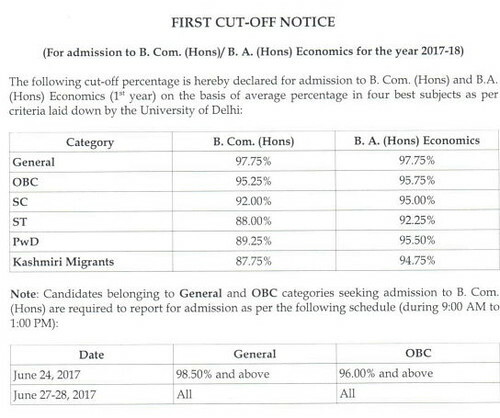 The Cut Off indicates the minimum marks required to get admission in the college SRCC also gives hostel facilities to the enrolled students. Hostel Seats for both boys and girls seats available in Shri Ram College of Commerce hostel.